Exposure to outdoor and indoor air pollution can cause both short-term and long-term health effects, including damage to the immune, neurological, reproductive, cardiovascular, and respiratory systems. Among racial and ethnic groups, Hispanic children aged 3 to 11 years had the lowest rate (30.7%) of exposure to secondhand smoke in 2009–10. Between 2005–08 and 2009–10, the proportion of children aged 3 to 11 years exposed to secondhand smoke decreased by 19.5%. The AQI is an index for reporting daily air quality. The AQI runs from 0 to 500, with higher AQI values representing greater levels of air pollution. AQI values >100 are considered unhealthy. 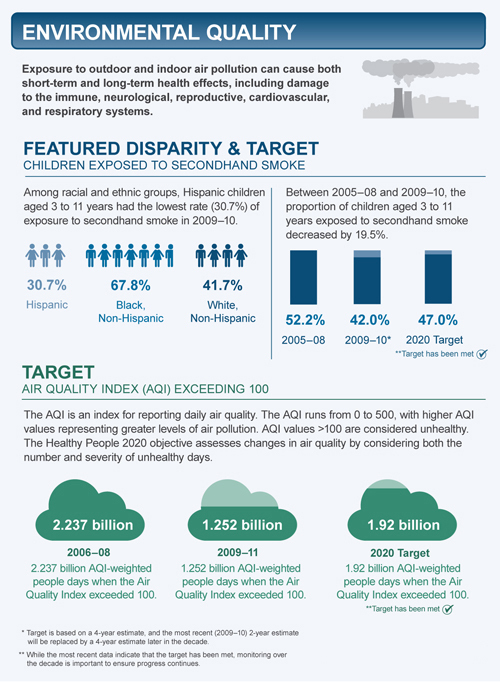 The Healthy People 2020 objective assesses changes in air quality by considering both the number and severity of unhealthy days. 2.237 billion AQI-weighted people days when the Air Quality Index exceeded 100. 1.252 billion AQI-weighted people days when the Air Quality Index exceeded 100. 1.92 billion AQI-weighted people days when the Air Quality Index exceeded 100. *Target is based on a 4-year estimate, and the most recent (2009–10) 2-year estimate will be replaced by a 4-year estimate later in the decade. **While the most recent data indicate that the target has been met, monitoring over the decade is important to ensure progress continues.